Wow. This book is raw and honest. As a writer for the Chicago Tribune, Author Julia Keller wrote a three-part series about traumatic brain injury. This experience, combined with the many real-life stories she was reading about American soldiers who were coming back home from Iraq and Afghanistan with brain injuries, was the motivation behind this incredible story. 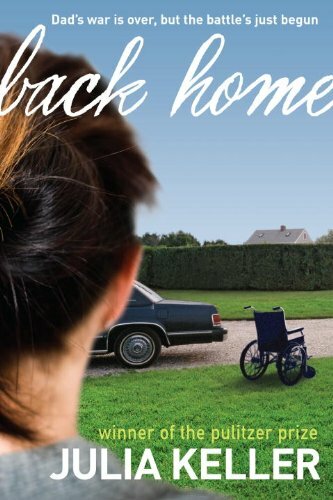 Back Home is about a family who is forced to deal with, as a result from war, a huge change. Their father has been injured—he has a traumatic brain injury. From the view point of the eldest daughter in the family, Rachel, we are allowed a look into the personal and honest feelings of how difficult this can be for the entire family. Rachel’s character lets readers into her mind and offers them a deep and emotional understanding of what living with a family member who has suffered a traumatic brain injury is really like. This is a poignant novel that I recommend reading together as a family. Thanks for your review. The book sounds very interesting, and potentially quite helpful for children who know veterans returning from Iraq or Afghanistan (or any other combat zone for that matter). I have a question though: this sounds like possibly difficult, intense, or even scary material to work through for children, even for a ten-year-old. Are there particularly sensitive, scary, or intense moments in the book that adults should know about when considering the book for a child? Thanks for your blog. I’m greatly enjoying it! There is nothing easy about the topic of this book. The family is certainly struggling with the changes that come from the brain injury, and there are many intense and emotional moments. I highly recommend that the book be read together as a family, that way any difficult questions that arise can be disscussed thoroughly. Parents of sensitive children, or children who may be sensitive to the topic, may prefer to read the book before presenting it to their children–especially the younger set.